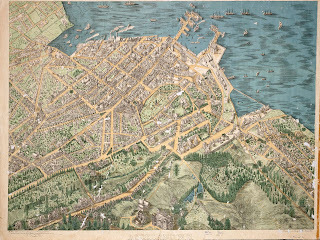 Known also as ‘panoramic’ or ‘perspective’ maps, bird's-eye views of cities became popular in many parts of the world during the last quarter of the nineteenth century. The idea was to depict street patterns, prominent buildings and other landscape features as if viewed from above at an oblique angle. Sometimes the artists had recourse to hot-air balloons. More often, as was probably the case with this rendition of Auckland, they were reliant on observations made while trudging the city streets and the vistas available from taller buildings. The inscription on the lower left corner reads: ‘This view is compiled and drawn as from a point one thousand feet above and one hundred feet to the rear of the hospital during the year 1885 and part of 1886, by George Treacy Stevens'. Little is known about the artist. He might be the ‘George Stevens’ buried in Karori Cemetery, Wellington, in 1916. Another copy of this map (G9084.A8, Maps Collection) is also held by the Auckland War Memorial Museum. 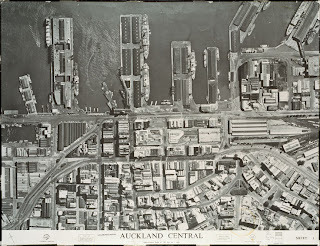 In spite of large changes to the foreshore, Aucklanders will find much that is familiar in the 1886 bird's-eye view. The street names are the same as today with only a few exceptions, such as Alexandra (now Airedale), Abercrombie (now Saint Paul) and Patteson (now Victoria Street West). However, there are a few traps for the unwary. For example, the structure spanning Grafton Gully in the foreground is not the current ferro-concrete Grafton Bridge (which was not completed until April 1910), but the wooden footbridge designed by city engineer William Anderson and erected in 1884. 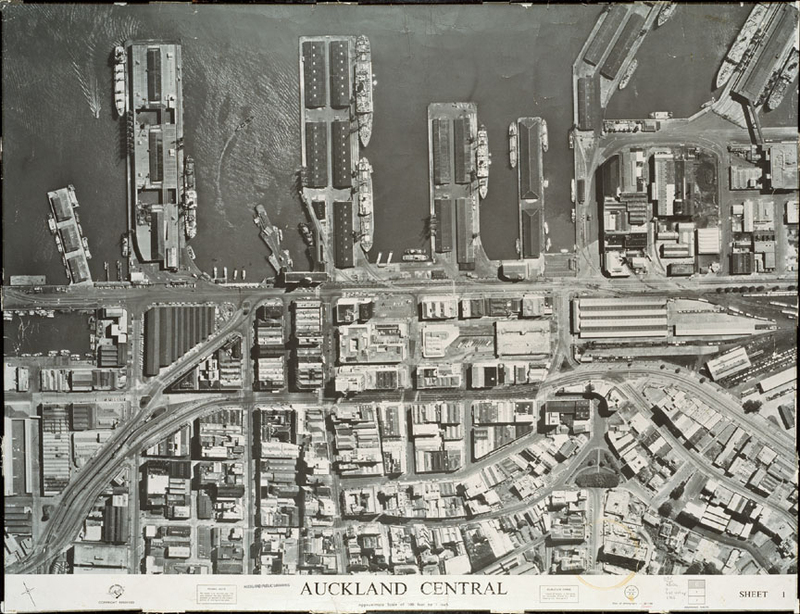 The Heritage Images database contains a large number of aerial views of Auckland, which gives a good picture of the growth of the city over the years. It allows you to compare the different technologies over time from painstakingly hand drawn aerials to photographic aerials. You can also find out more about the map resources held in the heritage collections at Auckland Libraries.